At Miramont Family Medicine, our goal is to be the absolute best at what we do. Each and every doctor that works at Miramont has been specifically trained to help patients regardless of what ails them. If you’ve been searching for a doctor you can trust, look no further. At Miramont Family Medicine, we’re here to help. With locations in Parker, Wellington, and Fort Collins, we’re able to serve a large portion of Colorado. But what is it exactly that makes the doctors at Miramont Family Medicine different than the rest? Keep reading to find out! If you’ve been following along with our blogs, you may have noticed one in particular where we highlighted a few reviews that we’ve gotten recently. In that blog, we pointed out a few testimonials where our patients said that the doctors at Miramont are what draws them in, making them feel cared for. What else makes us the best? When you visit a doctor at Miramont Family Medicine, you won’t have to feel like you’re being rushed in and rushed out in order to fit as many patients as possible into the schedule. Instead, we’ll take our time with you, making sure to do our work thoroughly and take great care of you. You don’t have to feel like you’re nothing more than a 20 minute chunk of our day. Our goal is to do everything we can to provide you with the level of healthcare you deserve. One of the things we’re known for the most at Miramont Family Medicine is how friendly our staff is. Whether it’s a doctor, a nurse, or a receptionist at the front desk, you can be sure that everyone on our staff will greet you with a smile. We genuinely care about each and every one of our patients and we’ll go above and beyond to show it. 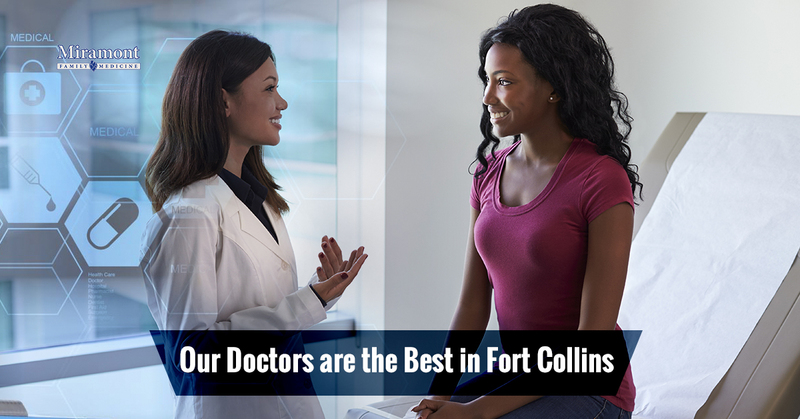 Perhaps best of all is that no matter what part of Northern Colorado you’re in, there’s a doctor’s office nearby. With locations in Wellington, Parker, and two in Fort Collins, we’re always right around the corner. When you need to visit a doctor, you can rest assured that we’re also close by. Rest assured that each of our locations is known for a friendly staff, just like we mentioned above! No matter who you are or what your reason for visiting is, you can count on the doctors at Miramont Family Medicine to provide you with a level of care that’s simply unmatched by others in our industry. Great healthcare is only a phone call away no matter what part of Colorado you find yourself in. If you’re in need of a trip to the doctor, put your trust in our team and rest assured that we’ll be there for you every step of the way. Schedule an appointment today. We look forward to meeting with you!